Meadows Cleaners in Maple Ridge wants to help you get the most out of our eco-friendly dry cleaning services! Dry cleaning is a process of using solvents to remove soils and stains from a range of fabrics. The term ‘dry cleaning’ is misleading. The cleaning is done with a liquid, but this liquid solvent contains little or no water and does not penetrate the fibres of your clothing like water does in a home washer. The first step of eco-friendly dry cleaning is pre-treatment. This stage aims to attack spots and stains with special cleaning agents. This step is followed by loading your clothes into a machine that looks like an oversized front-loading washer. This machine uses mechanical action to help release spots, stains and soil from your clothing. The cleaning solvent is filtered and distilled many times throughout the cleaning process to prevent soil from resettling on your clothes. The final step includes drying your garment in the same machine. Your clothes should smell fresh and be free of any stains or smudges by the end of the process. Follow the advice below to achieve the best dry cleaning results! A dry cleaner should use current technologies for removing spots, cleaning clothes and repairing garments. Bring a stained garment as soon as possible to Meadows Cleaners in Maple Ridge to prevent a stain from setting permanently. If you know what caused the stain, tell your dry cleaning professional. Never iron soiled or stained clothing. The heat from the iron will cause stains to set and drive the soil deeper into your clothes. Do not rub a stain, especially when dealing with silk garments. Don’t accept harsh solvent odours on your clothing. Meadows Cleaners promises odour-free garments every time. Damask made from silk or wool as well as velvet and velveteen should always be dry cleaned. Professional dry cleaning is recommended for heavier garments as well as structured silk garments. Trust the Meadows Cleaners team to clean any fabric that is easily stained. Don’t store your dry cleaning in the plastic bags used for pick-up. 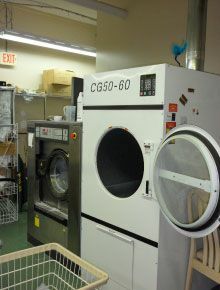 Our unique odor-less equipment is all state-of-the-art and we are only 1 of 12 Dry Cleaners in all of BC recognized as an Eco-Friendly Dry Cleaner.